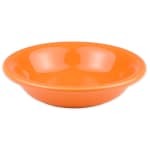 The Homer Laughlin 459325 Fiesta bowl is made of china for durability in commercial settings. The dish will not easily chip or scratch, and the surface has been fully vitrified for strength. With a 53⁄8 inch diameter, the bowl is small enough to easily sit next to other dishes and not take up too much tabletop space. Small portions of salads, soups, and pastas or side dishes can easily fit in the 61⁄4 ounce capacity. The Homer Laughlin 459325 Fiesta bowl comes in tangerine to stand out among other dishes.